With its innovative, sporty and dynamic design, ergonomic fit and components which make it a multifunctional system solution, the Drager HPS 7000 Firefighter's Helmet is in a class of its own, giving you optimum protection during every operation. In close cooperation with worldwide customers, the Drager HPS 7000 Firefighter's Helmet was designed to meet this requirement. Two helmet shells for head sizes from 50 to 66 cm cover a wide range of individual head and face shapes. The Drager HPS 7000 Firefighter's Helmet is one of the lightest helmets in its class, weighing just 1.38kg approx in the basic version. The HPS 7000 stands out with a high level of operating and wearing comfort, with skin friendly, anti allergic and comfortable interior fitting. Individual adjustment can be achieved with the padded 4-point harness allowing for any head shape. The optimum balance of the helmet can be adjusted individually in the neck and chin area. A comfortable fit is ensured, as the padding is made of Nomex. A good climate is achieved inside the helmet, with a comfort hairnet, which allows the height to be adjusted. The head size can be rapidly adjusted in an operation, with an easy-to-operate size adjustment wheel with safety mechanism on the outer shell, even with wet and thick gloves. The wearer's neck muscles are relieved by the ergonomic helmet design that evenly distributes the weight to the head. The best visibility from the helmet is achieved by the large and modern facial protection visor that offers unrestricted protection. For operations under chemical protective suits, the visor can be fixed permanently. Alternatively, the Drager HPS 7000 Firefighter's Helmet has integrated and individually adjustable protective goggles with integrated softpad edge protection. 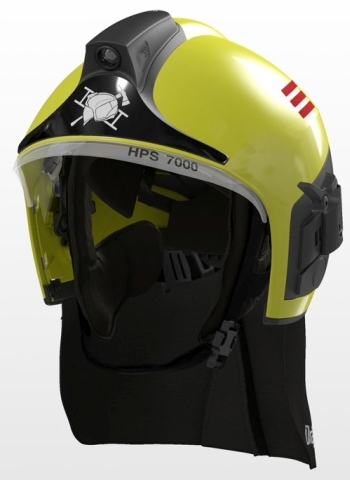 The Drager HPS 7000 Firefighter's Helmet can be ordered in a variety of colours and an individual emblem on the front plate can also be added. This helps make each helmet personally distinguishing.